Credit : Courtesy of VITRINE. Photographer: Jonathan Bassett. 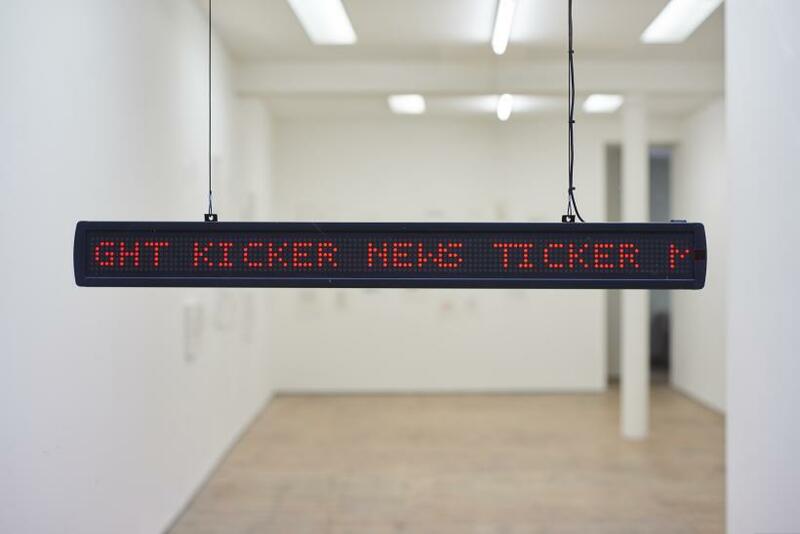 Tim Etchells’ current exhibition, ‘The Facts On The Ground’, is made up of a text installation, a performance and a neon installation, exhibited over VITRINE’s two spaces in Bermondsey Street and nearby Bermondsey Square. 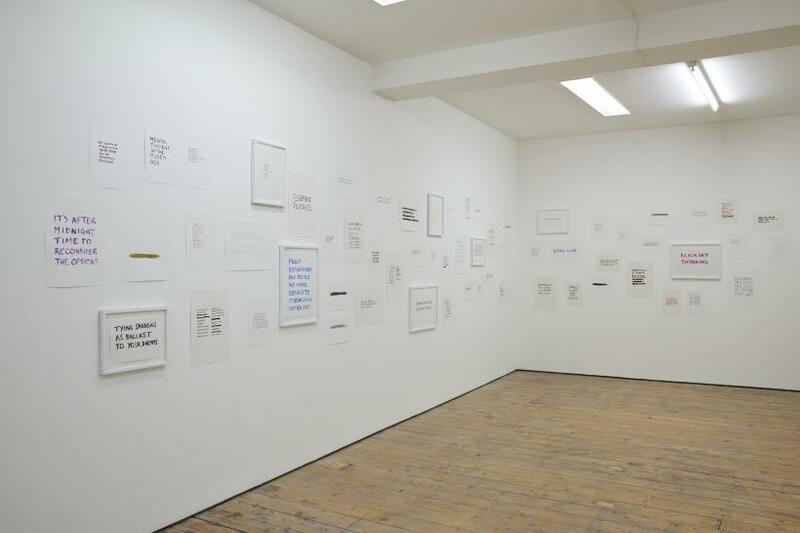 The new body of work, ‘Personal Statement’, at VITRINE Bermondsey Street, displays a salon- style installation of acrylic and graphite drawings on paper, in varied dimensions. A first impression is difficult to ascertain: text work can appear cold and empty but give it a bit of time and the words slink away from the wall, warm up, and begin to have a bit of fun. 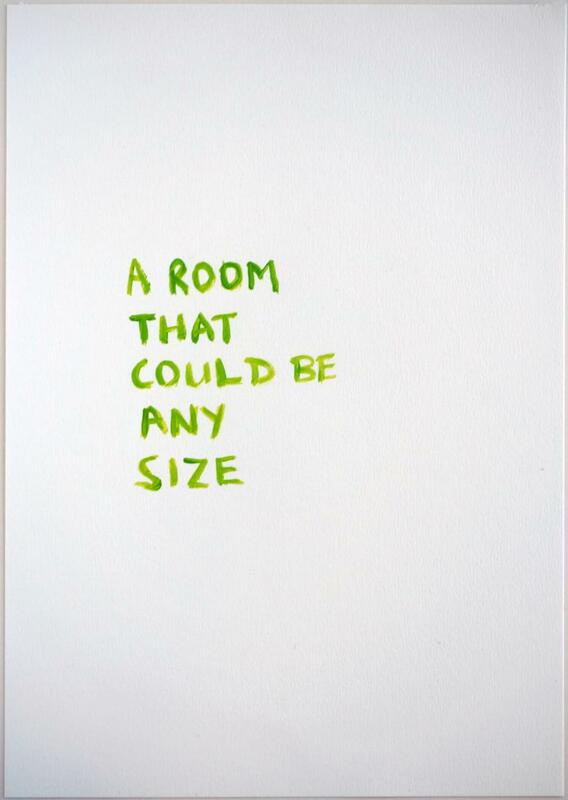 Fragments of text - overheard conversations, single words, phrases, instructions and appropriated notes - are handwritten in different sizes and colours. Generic categorisation is an important mental act performed to help us navigate our environment. The differences in the texts slow the viewing process down and make us think about how quick we are to form judgment, and assume understanding so quickly: ‘THE/ ENERGY/ YOU EXPEND/ JUST TRYING/ TO KEEP/ A HUMAN/ SHAPE’. The handwritten nature of the work seems tongue-in-cheek. Words are marked out, ‘seeping through’, ‘bleeding through’, some bold statements, some repeated, different colours, some in black, some in a warning red: ‘THE MORE/ YOU/ LOOK/ AT IT/ THE MORE/ IT LOOKS/ LIKE/ A/ WARNING’. And, then, how to approach the texts? Dive right in, or systematically approach the works in an orderly fashion, from left to right, or right to left, or starting somewhere in the middle and spiraling outwards? You can stop at works which strike a chord or which ring clearly in your head, or those written in bright colours, or perhaps a mixture of the above: ‘EYES/ THE/ COLOUR/ OF/ SOUND’. 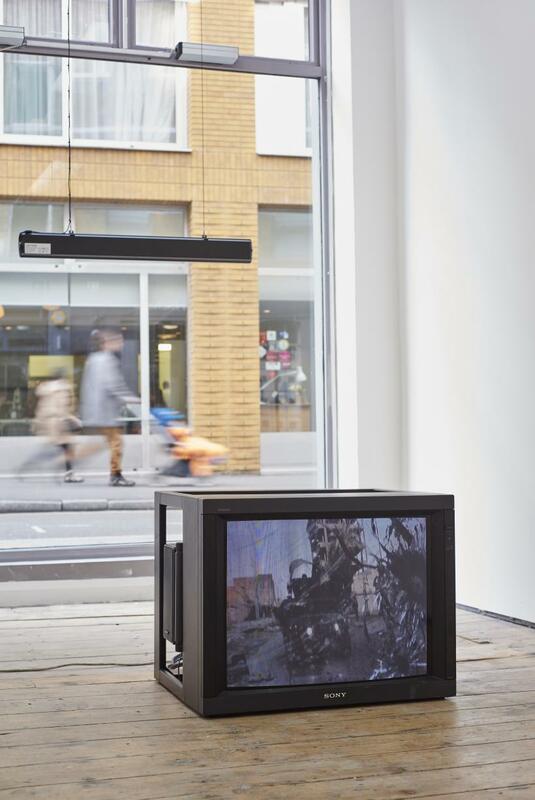 Etchells’ work here is a lot about you as viewer. 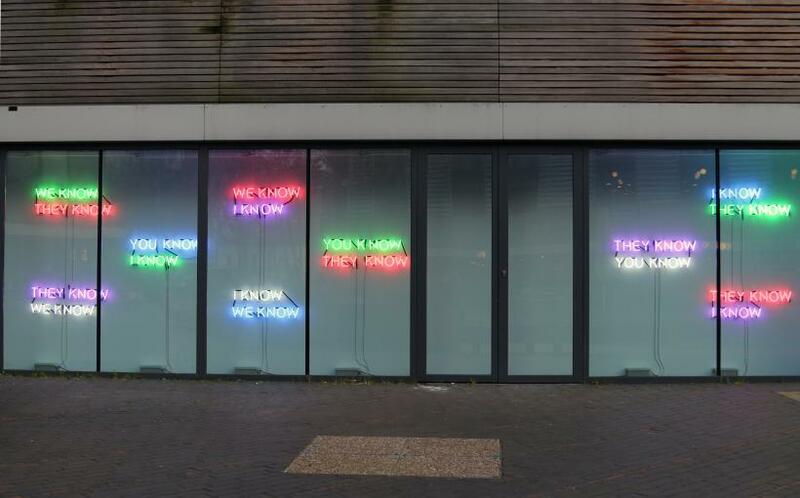 In fact, in the spirit of Etchell’s neon installation, ‘Who Knows’, in Bermondsey Square, which combines the phrases, ‘I know’, ‘You Know’, ‘They Know’, ‘We Know’, the work is a lot about all of us - the meanings we impart to words. Etchells teases this out with his nod to the formal system of grammatical declensions. Stand in front of the work and the words create meaning as they bounce off the viewer, if they can catch it. 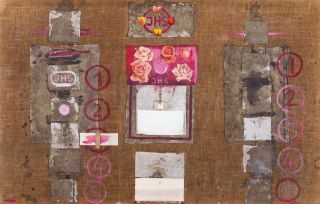 The beating heart of the works are the possibilities of language, being open to interpretation, translation, understanding. Etchells’ text work is inextricably linked with performance, and within the spectator-readers lie the meaning. All readers and viewers of his work bring understanding, histories and expectations: we create the work. This changes dependent on individual circumstances. We are: ‘ACTORS/ DISGUISED/ AS/ SPECTATORS’. 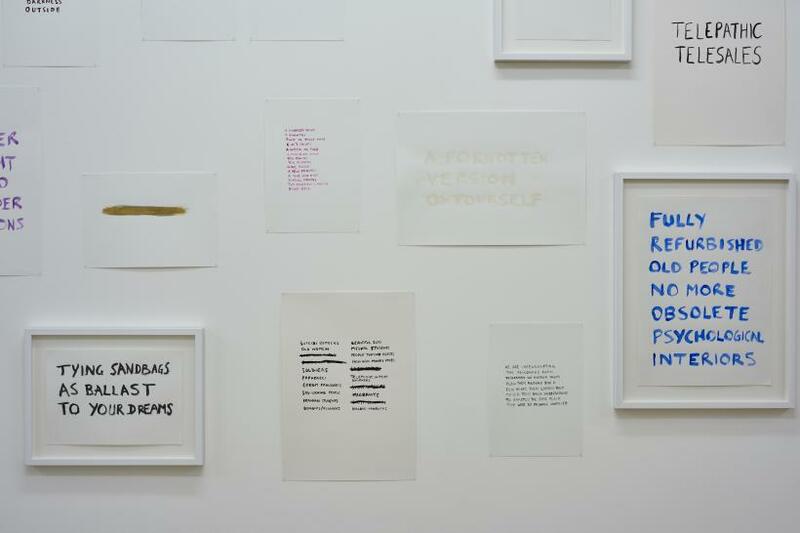 At the Private View, Etchells presented a short improvised performance under the title ‘Word File (VITRINE)’ which was concerned with the semantic aspects of spoken language. Words were repeated over and over, until the sense was squeezed out of them. This was at times painful to listen to and evoked frustration. Similar to children’s word games, the performance evoked a sense of playfulness yet it was not childish. The textural and musical qualities that language acquires when spoken are different than when read, as in ‘Typographical error/ Topographical terror’, and the point can easily be missed if the words are not seen and heard simultaneously: ‘SCATTER/ LOGICAL’. A misunderstanding is not unlikely here. Etchells negotiates between what is meant, what is seen, and what is heard, exploring the space between cultural conventions and subjectivity. The comical comes into play and influences meaning. These short, poetical, pithy, phrases are a glorious antidote to Snapchat and texts, bringing to mind the way that we quickly, and sometimes thoughtlessly, communicate with one another. Following Hans-Georg Gadamer’s aesthetics of reception, a literary work is not an object that stands alone and offers the same view to each reader. 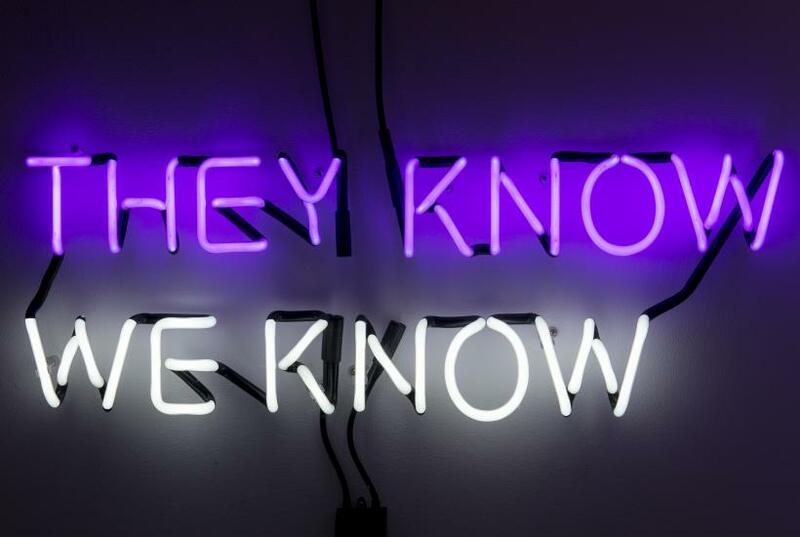 Whether walking past ‘Who Knows’ in Bermondsey Square, or past the gallery on Bermondsey Street, these words create an interlocutor capable of understanding them. 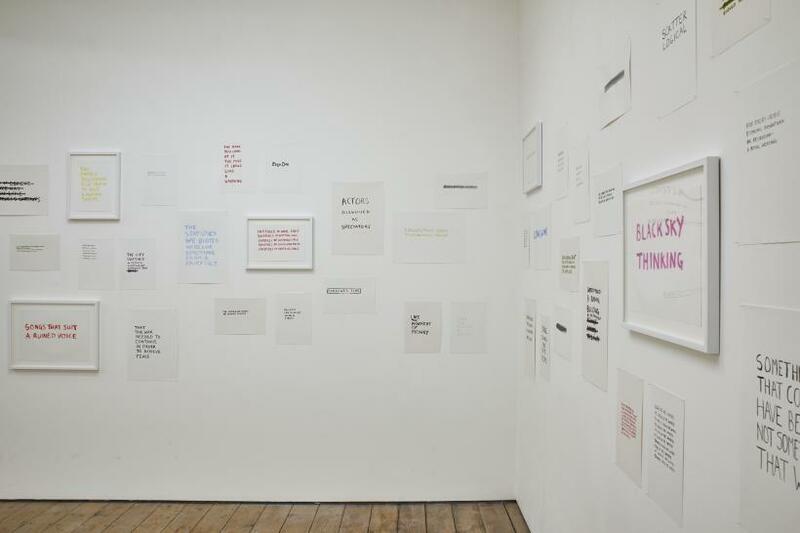 The title of the work in the gallery, ‘Personal Statement’, is a micro-comment on the exhibition itself, a clever double entendre, both indicative of Etchells’ ongoing work with text, language and performance and an opening up of the phrase. Whose personal statement are we talking about here? Who does this work belong to? The two words of the title question the possibilities and limitations of language, as well as the conditions of performativity and liveness. 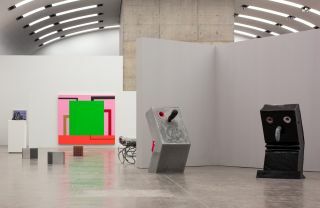 Etchells addresses the relationship between artistic and social practices by placing the work, ‘Who Knows’, in a public context, investigating its role as a democratic, unstable, site for reflection, open to understanding by the reader-spectator. 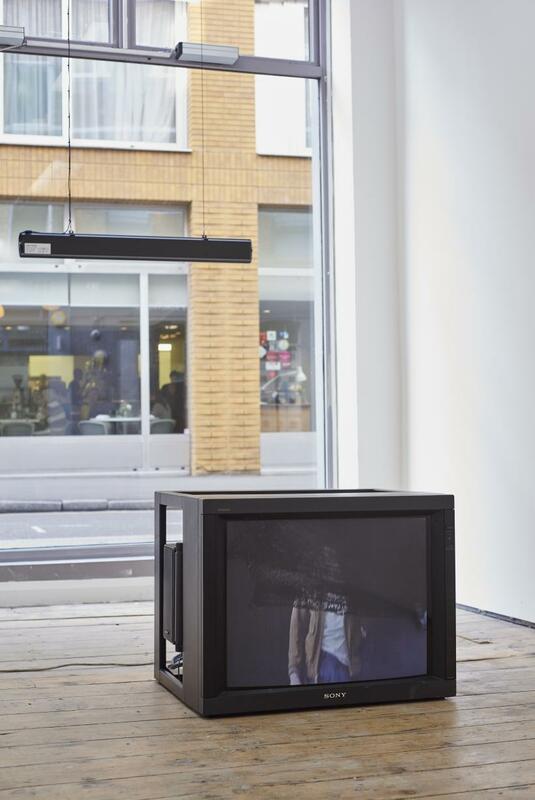 ‘Who Knows’, and the LED work in the window on Bermondsey Street, flirts with theatricality and performance. The text can speed up, slow down and stop. It is controlled by passers-by who can match the pace, or stop to read the moving text. By viewing the work outside of the gallery, Etchells explicitly address the possibilities of language within individual and collective cultural identities outside of the gallery. Works become a part of public consciousness and the landscape. The constellation of these parts provide a strength that would be absent if solely sited in the gallery. When spoilt for choice for experiential, overt stimulation and thoroughly immersive work, text work and near-empty walls can be a frustrating exercise. It needs to be given time. Actively reading enables an individual journey through words and associations. Etchells’ work makes you want to come back again, and move again, and it is worth the visit to see where the work takes you.